Your purchases add up to big rewards. Use FlexPerks with your phone and enjoy the convenience of mobile payments. 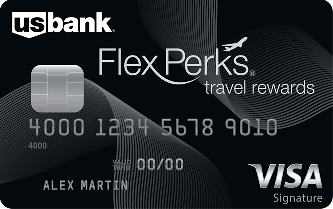 For example 25,000 FlexPoints can be redeemed for $375 in airfare, hotel stays, car rentals and more. Kick your FlexPoints into overdrive when you make purchases in select categories. Redeem your FlexPoints on hundreds of airlines, thousands of hotels, car rentals and cruise lines.